How many times have you left a meeting thinking it was a waste of time? Have you ever felt ‘meeting dread’ because you know that the next hour is time better spent actually getting work done? The fact is most of the meetings we attend during the day don’t accomplishing anything. Meetings with no agenda, meetings full of non sequiturs, or meetings with no actionable deliverables to follow up on afterwards are far too common in the work place. create and assign tasks that attendees can work on afterward. Let’s take a look at four ways the the meetings notes blueprint will improve the way your team prepares and holds meetings. The best kind of meeting is the one every attendee is prepared for. That starts with sharing a clearly defined meeting agenda ahead of time. 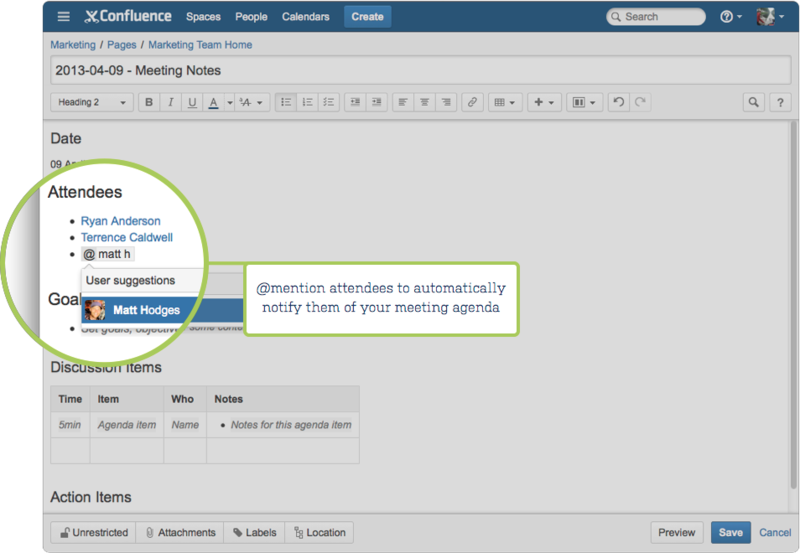 It’s easy to get everyone on the same page to contribute to the agenda using @mentions. @mentions automatically notify attendees of the page through Confluence’s in-app notification center, WorkBox, so you don’t have to send an email to notify them. Confluence does all of the hard work for you. It’s important to record the discussions and decisions made throughout the course of a meeting. This helps attendees remember what occurred during the meeting and keeps other key stakeholders updated who weren’t able to join. By making these discussions available to everyone, your team can stay informed after the meeting. An effective meeting is one that acts as a launching pad for more work following the meeting. Too many meetings fizzle due to a lack of action items. 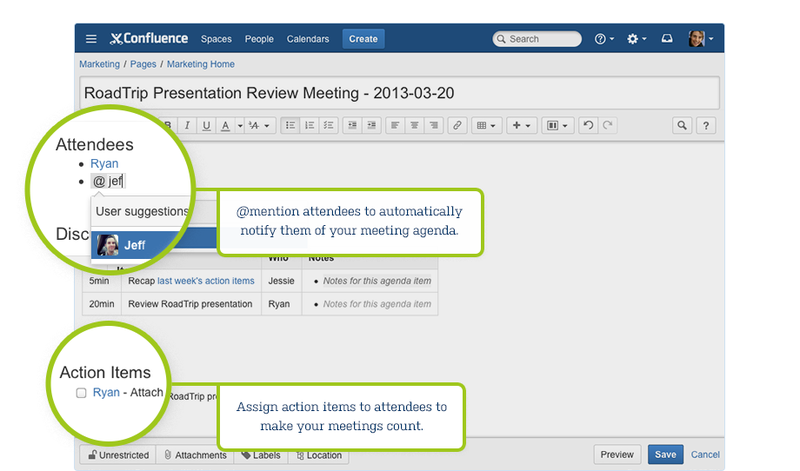 Confluence Tasks are perfect for kick-starting activity after a meeting. It’s easy for the meeting attendees to track the work that needs to get done and by whom, and when tasks are completed every attendee is automatically notified. 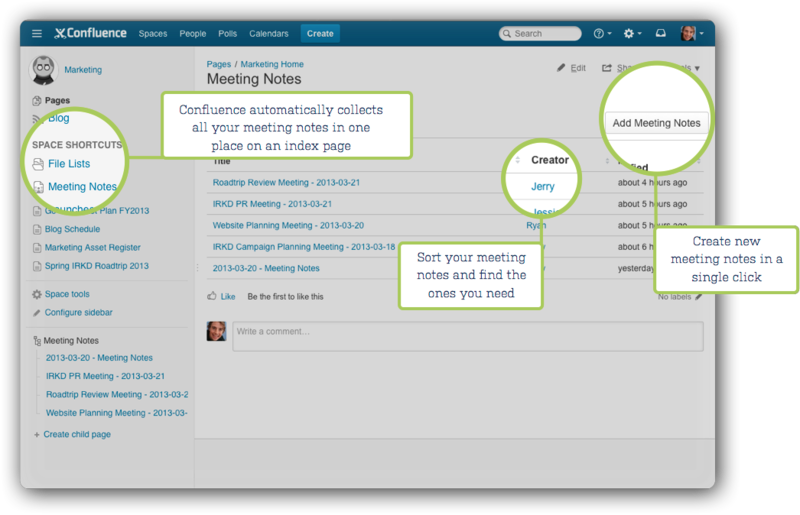 When you use the Meeting Notes blueprint, Confluence automatically organizes all your meeting notes in one place, accessible from the Space Sidebar, so teammates can quickly find them later. Gone are the days of wasting time searching your email inbox and shared network drives. Want to learn even more tips and tricks about Confluence? Sign up for the Confluence Insiders Email to stay in the loop.